This organ was imported from Italy in the early 1930s by Alec Hodsdon, one of the pioneer early keyboard instrument makers. He claimed that it was made by one Giovanni Giovaninni, for a convent in Lucca. He sold it to Margaret Glyn, one of the early editors of 16th and 17th century English keyboard music. After her death it suffered various vicissitudes before being rescued by Sheila Lawrence in 1988. It is at present in the English Organ School, at Milborne Port in Dorset, run by Margaret Phillips www.margaretphillips.org.uk/ The style and condition of the original parts of the organ suggest the mid 17th century. 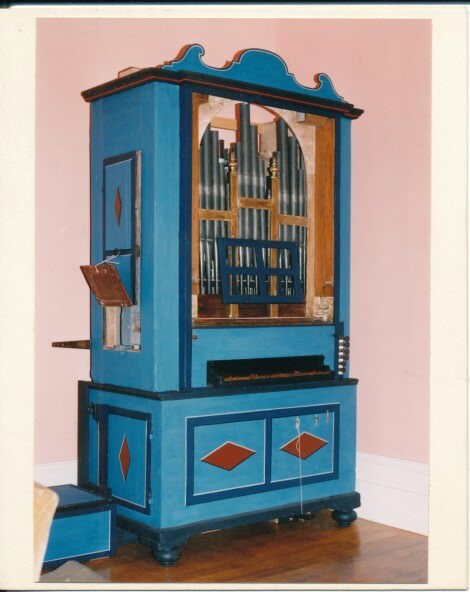 During the middle years of the 19th century the organ acquired stop knobs and a drum stop, with additions to the sides of the case to hide them. After Margaret Glyn’s death, the organ lost the carvings on the top of the organ and around the tops of the pipes, some of the pipes in the upperwork, and somehow lost about 200mm in the case height. Martin Goetze has brought it back to playing condition over a few years, stabilising the case, making it wind tight, and restoring and regulating. The original paintwork and ornaments had been removed, leaving an unsightly finish. This has been covered with new paint which can itself be removed with water.